that you wanted them to be...and more! Camelia Carnation Collection to share with you. Brilliance Pearlescent Ivy Ink, VersaMark, Clear Embossing Powder, Sponge, Mini Ink Blending Tool, Big Shot Plus, Misti, Water Spritzer, Pearl White Metallic Cardstock, Coral Cardstock from my Stash, Spellbinders Fancy Lattice Die, Dimensional squares Hot glue gun. Card size is 5” x 7”. Cut Pearl Metallic cardstock to 10” x 7” and score at 5” to create the card base. Cut Coral Cardstock 4 7/8” x 6 7/8. Cut another piece of Pearl White Metallic cardstock 4 5/8” x 6 5/8”. Diecut the window box elements die and the Lattice from White Pearl Metallic Cardstock. Stamp the Fanciful Carnation on the 4 5/8” x 6 5/8” piece with VersaMark and heat set with clear embossing powder. 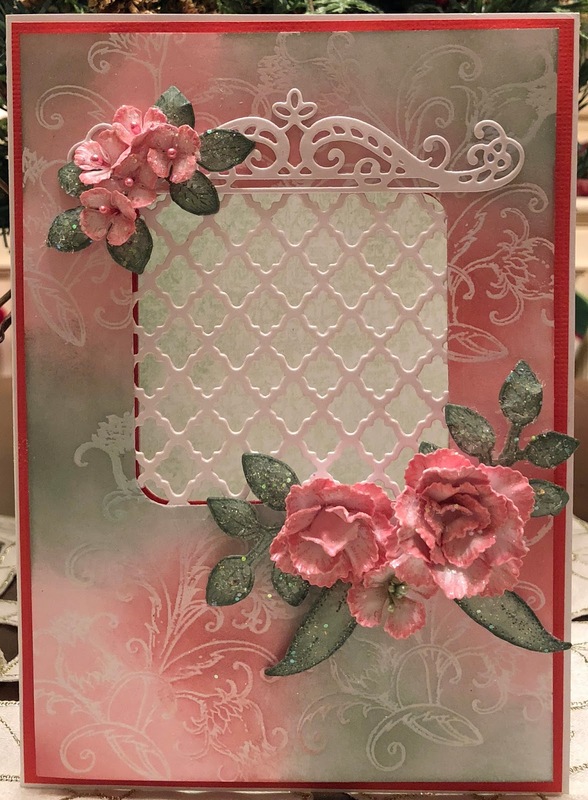 Use the blending tools to color the stamped cardstock with Pearlescent Poppy, Pearlescent Coral and Pearlescent Ivy inks. Use the Cut Mat Create 2A die to cut out the opening in all the layers. Adhere the lattice behind the top layer with dries clear adhesive. Adhere the Coral Cardstock to the card base with dries clear and then adhere the top layer with dimensional squares. Adhere the decorative window box elements diecut to the top of the opening. Cut a piece of green paper from the Camelia Carnation paper collection, ink the edges and adhere to the inside of the card. 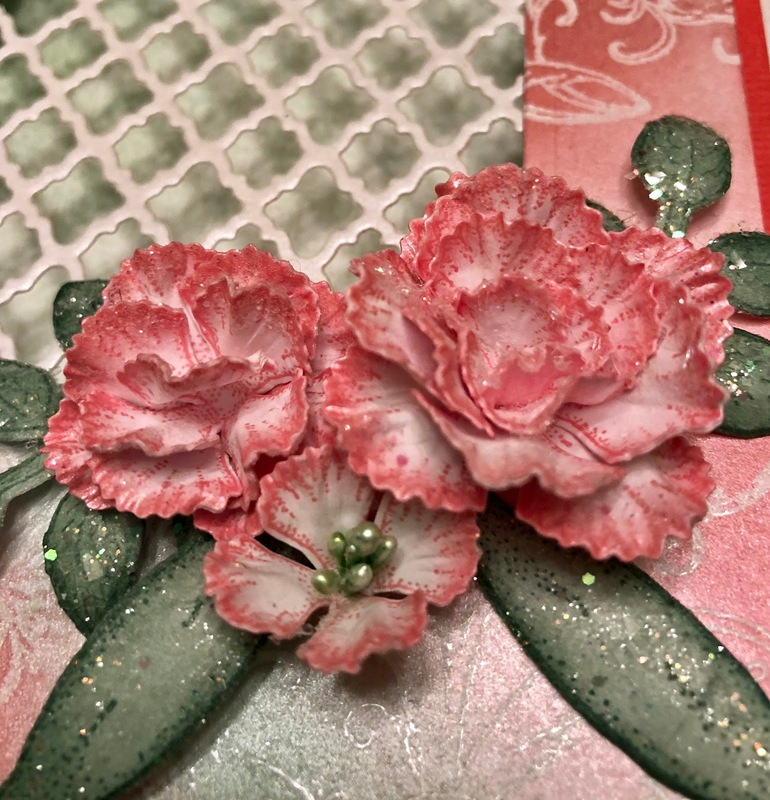 Stamp the small carnations on white cardstock with Pearlescent Coral ink, diecut with coordinating die, color the edges and place in the Floral Basics mold, spritz with water and run through the die cutting machine. Continue shaping with your hands. Stamp the leaves from the Leafy Branch Cling Stamp Set and the Camelia Carnation Stamp set with Ivy ink and color with bamboo leaves. Diecut with coordinating die and shape with the deluxe flower shaping kit. Sponge the flowers and leaves with dries clear adhesive and sprinkle with Crystal Clear. Pierce holes in the centers of the small flowers and insert the stamens. Adhere the flowers and leaves to the card as shown using a hot glue gun. Thank you so much for stopping by...I really appreciate you. Beautiful Janet!! Love that lattice die cut! !